The City of Houston Office of Emergency Management (OEM) is reminding Houstonians that Hurricane Season starts today, June 1st and runs through November 30th. Houstonians should take steps to begin the process of preparing. Storms like Alison, Ike and Carla have all impacted Houston at various times throughout the season, so it's important to prepare now. Every Houston family should have an emergency plan that details where they will go in the event of an emergency. Those Houston families who live in a hurricane evacuation zone should know where they will go ahead of time and have an out-of-town contact to check-in with to make sure the family is able to communicate. A sample plan is available from Ready.gov. Only those residents who either live in an evacuation zone, or who use a medical device which requires electricity to sustain their life should evacuate ahead of a storm. To find local evacuation zones, visit houstontx.gov/hurricanes and click on "Hurricane Evacuation". Houston residents who might need additional help in evacuating during a disaster can visit the OEM website to learn more about the State of Texas Emergency Assistance Registry (STEAR), which is used by local agencies to identify those with disabilities and other needs, in an effort to provide better assistance to them ahead of, and after an emergency. Residents should also know their level of risk ahead of a storm. The Houston Storm Risk Calculator (houstonstormrisk.org) displays a map of hurricane risks from storm surge, flooding, wind and power outage down to the neighborhood level. Houston residents should have what they need to be on their own for 5-7 days following a storm. This includes food, water, medications and individual needs such as medical devices or pet supplies. Additionally, its important to have tools, sturdy shoes and clothes to help in the immediate repair of your home following a storm. During disasters, having a community around you that can help is essential to making it through. Meet your neighbors, and build a plan that includes sharing resources, such as generators, chainsaws and tools to prepare for, and respond to a hurricane. 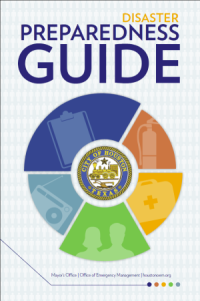 The City's Disaster Preparedness Guide, which is available in English, Spanish, Vietnamese, Chinese, Arabic and Urdu to Houston residents and businesses free by calling 311 or visiting houstonoem.org has a detailed list of what should be in your emergency kit, as well as the steps you should take to prepare your family ahead of a hurricane.